If you haven’t sold a car on your own before or even if you’ve sold a few of them, one thing you for sure want to make sure you do is have a car bill of sale document. If you don’t have the buyer sign one, you could be heading for a mountain of trouble. 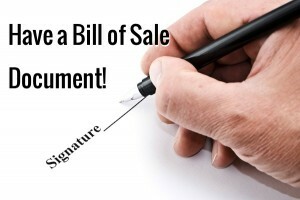 What is a Bill of Sale Document? This document is like a receipt but maybe even better. It states what you’re selling, what the buyer is buying, for how much and on what date. I like to always include that the vehicle is “as is” and does not include a warranty. It’s good to include that the sale is final / no returns – these are your terms of the sale and when the buyer signs it, they’re saying they agree to these terms. Have a place for them to sign and date it. I like to have a place where they fill in their name, address and phone, too. When you conduct your sale, you should be asking them for their driver’s license. I look at it and will also ask if I can photocopy it or snap a picture of it with my phone for my records. Make sure it’s them and that the address matches up. Either have two documents (one for you and one for them) which you both sign or if you have a printer at home with a photocopier, then make a copy of the one document. Make sure you both walk away with a copy. Ok, So Why Do All This? What if they want their money back? If they come back later and want their money back (I would bet this happens more often than you’d think), you have this document showing that the car was sold and there are no refunds. This is, of course, subject to local laws – as there may be what is called a “cooling off” period in some local laws where the buyer does have the chance to get their money back. Check with your local DMV for sure. What if they never sign the title / register it? If the buyer of the car never registers the car with your local DMV, then according to your state, you look like the legal owner of the car. It might be abandoned, it might end up at a junk yard (where you might receive a bill for fees) or it might even be used in a crime. The bill of sale document helps to release you from these things. Really, is this not reason enough for you to have one? You might not ever see this person again, so when you have them with you, make sure you’ve both agreed on the terms of the sale. This document helps to prove that you did both agree in person. What if they get in an accident on the way home or before they register it? Just like if they abandon the care or something, having a bill of sale document for the car you just sold helps to make sure you are not liable for that vehicle any longer. Another Warning: Title Transfer IS Needed! Please note: the sale might not be legally finalized until a title transfer is done. 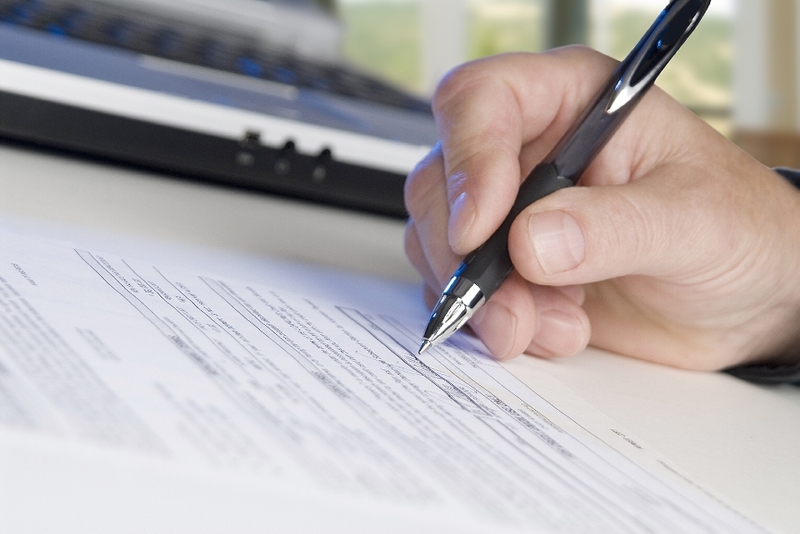 A bill of sale document does not prove legal ownership of a vehicle. If possible, go with the buyer to the DMV and get the title transfer done. I know this isn’t probably considered normal but if you’re worried at all, doing this will help you sleep better at night. It’s a business transaction, so do what you need to do. I’m not going to re-hash everything written so far about having a bill of sale since we have another article here on the website about that but I wanted to list some warnings and things to be careful of. 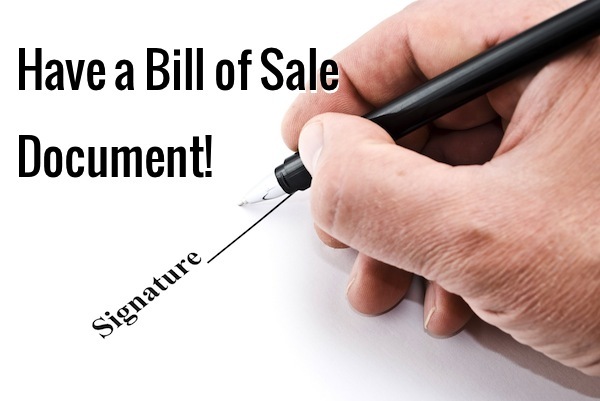 No, the bill of sale document isn’t an official document but it certainly can help. It’s something and something is better than nothing. To be sure you’re safely legal and to be sure the transaction has been officially completed, the title transfer must be done because then, your state government is satisfied with the sale and it’s legal. If you have more questions, please look through other articles here or else post a question in the comments area below. If you liked this article, please share it with your friends and others with your social media accounts so that everyone can find out about it and enjoy it. This entry was posted in Car Selling Tips and tagged bill of sale for car, bill of sale form, legal document, Selling A Car, title transfer, warning by TC. Bookmark the permalink.